You are currently browsing the The Pet Product Guru blog archives for the day Tuesday, August 27th, 2013. 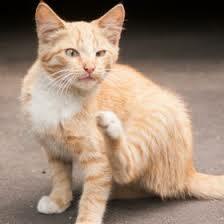 Seasonal changes, the winter could dry a cats skin out. Environmental factors like contact with certain chemicals or fabrics can cause skin irritation. This is why it’s important to see your vet who will properly diagnose the problem. If you’re a music lover, you’ll love the EDGEWATER INTERNET RADIO NETWORK!